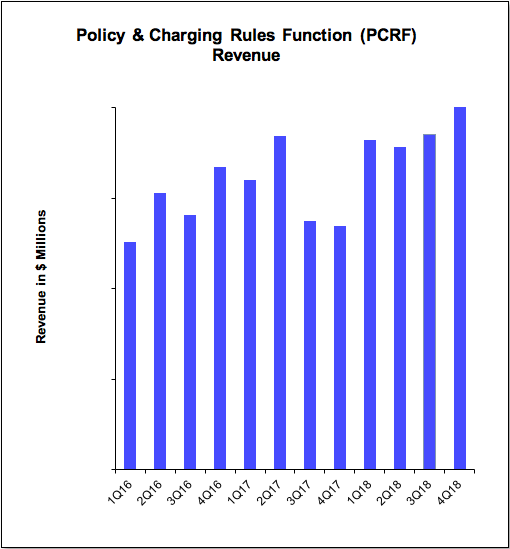 In 4Q17, the total PCRF market (product revenues only) fell 2% sequentially, and 20% compared to 4Q16, to $214 million. The market in 2H17, and especially 4Q17, was weaker than expected as the largest vendor, Huawei, experienced large sequential contractions in session shipments due to seasonal factors and order volatility. Nevertheless, we believe that the underlying demand remains robust. For the full-year 2017 the total PCRF market grew 5% and we expect that the market will rebound from the weaker-than-expected 2H17, to grow 30% in 2018.